*50 trains made up of 5 cars each. *10 trains made up of 4 cars each. Included in the contract are funds for training, spare parts, tools, diagnostic testing equipment, and other services that will be needed to support the fleet. The awards was originally scheduled for August of last year. "What do New York City straphangers share in common with the folks in Plattsburgh, New York? Both got some welcome news when the MTA and Bombardier Transportation inked the contract to manufacture 300 new R179 subways cars at Bombardier’s Plattsburgh facility. The order specifies10 prototypes for testing and approval, followed by 50 five-car sets and 10 four-car sets, with revenue service expected around late 2016. For upstate residents, the $599 million deal will mean some 500 jobs and related revenue stimulus. 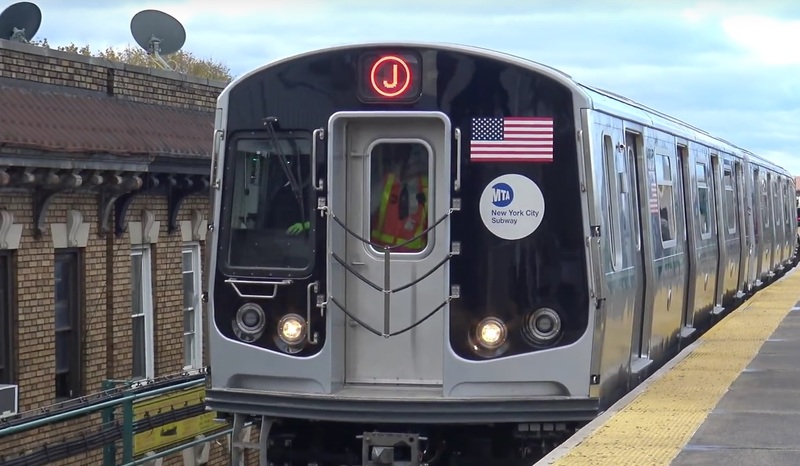 For riders on NYC Transit’s lettered B Division lines, it will mean a fleet of state-of-the-art subway cars to retire the aging R32s and R42s, some of which are approaching 50 years old, well past the expected service life of a subway car. The R179s are also slated for use on the Second Avenue Subway. What will the new cars look like? Lighting, climate controls, and digital voice announcements will all be upgraded. For riders, the most visible change will be in communications, including the strip map displays. As Wetherell explains, “Instead of a display map that counts down the stops, the new cars will have a route indicator with more flexible messaging capacity. The new cars’ audio and text message displays will also have greater flexibility, allowing NYC Transit to quickly update service modifications and scheduling information. Other improvements will be less visible. While the cars are not being purchased with closed-circuit television fully loaded, they will include the necessary wiring and conduits for future security camera installations. The new cars will also be lighter. By removing propulsion motors, lightening the floors, and making other materials changes, the trimmer R179s will improve overall energy efficiency. Though work in Plattsburgh has begun, much remains to be done before straphangers can actually enjoy their new ride. According to Wetherell, the design specifications will be drafted and reviewed over the next four to six months. After initial design, ten R179 prototypes will be delivered in about 33 months to undergo another nine to 12 months of track testing. Full scale production and revenue service is scheduled for late 2016 or early 2017. Cool, I hope the award goes to Kawasaki. Me too! 2011 is already shaping up to be my favorite year in MTA history. Cuz after 2010, anything looks good. Im really hoping Kawasaki gets it too. The order is small enough for them so it should be a perfect fit. Fingers crossed! Lol what's wrong with Bombardier? I see we got a lot of Kawasaki supporters here. Nothing really, I think everyone wants it to go to Kawasaki because one of there plants is in Yonkers, meaning more jobs and money for the state and they can be delivered faster. Although they still construct body shells in different places, R160 shells were made in Brazil. yes, so I think that when ENY gets the R179 4 car sets, either the R42's or the R179 should go to the . The Needs new cars of 10 cars. I have witnessed many times the getting so crowded. The R44's on the were a great help. If the stays 8 cars, I really hope the would put the R179 on the & give some R32 to ENY to put on the . Once the R179s are in, the R32s and R42s are out. Simple as that. The older cars can't stay around for much longer; that's why the R179 order has to take place. I think that applies tot he R160As (Alstom). i could be wrong though. The C will remain 8 cars. However it will be extended to 600 feet. The only reason R68s or R68As won't appear on the line is if Concourse or Coney Island doesn't give up the trains. It has nothing to do with NIMBYs; they'd probably prefer the R68s/R68As over the R46s because they're newer cars and anything would be a step up from the R32s. Thanks (Thanks button is missing on side of post :confused:). Im betting on Bombardier.Bombardier is also in N.Y.Plattsburgh to be exact.So money and jobs will be kept in New York. I don't care who gets to build these cars. I want to see if the picked the right contractors to build these cars, and I just want to see if it would get done in time. Since the R160's were built in Brazil then I guess they are Brazilian. I don't care who gets to build these cars. I want to see if the picked the right contractors to build these cars, and I just want to see if it would get done in time. Since the R160's were built in Brazil then I guess they are Brazilian. Anyone get the joke, and since trains are female they are Brazilian girls. B) Don't worry I am not racist the girl I like is Brazilian so it's a good thing for her nation. I know my jokes su*k so I deleted it, but you got me with my stupid joke. I hope it's a Bombardier as well. They have made great rail fleets in the past whether it has been with the NYC Subway, NJT, Metro North, etc. As of now, the R179 order is for 290 cars. There is an Option 1 for 50 additional cars, which if exercised, would total 340 of the original planned 420 R179 cars. With 250 R179s arranged as 5 car sets (plus the 50 additional Option 1 cars), they could go on the or even lines (ten car trains). With 40 R179s arranged as 4 car sets, they could go on the (J)/(Z) or lines (eight car trains) or even the line (four car trains). On the line, the 40 R179s arranged as 4 car sets would allow for 10 train sets; On the (J)/(Z) or lines, they would allow for 5 train sets. The R32 Brightliners would see their 50th anniversary on September 9, 2014; the R46s will see their 40th anniversary in 2015; the R68/R68As not until 2026-2028.